Product prices and availability are accurate as of 2019-04-10 14:06:17 EDT and are subject to change. Any price and availability information displayed on http://www.amazon.com/ at the time of purchase will apply to the purchase of this product. Café culture for the home countertop. Die-cast aluminum and zinc body. A full 4.5" (11.4 cm) clearance accommodates larger cups - ideal for espresso variations like Americano, Cappuccino, and Café Latte. Prior to extraction, the unique 15-bar Triple-Prime pump automatically releases three bursts of hot water into the filter head, causing the ground coffee to expand. 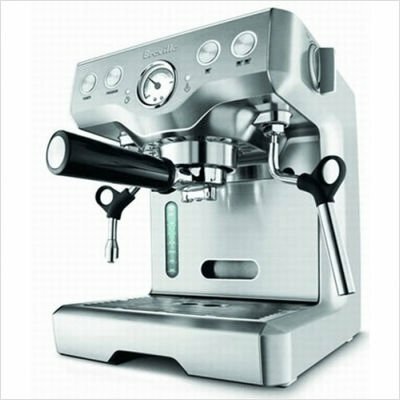 The increased pressure allows the machine to extract more crema and gives the coffee a rich, smooth taste. Both 'Single Wall' and 'Dual Wall' filters now included.